Counter balance design is ideal for die loading, machine feeding, and for loading and unloading trucks. High torque 24VDC drive and lift motor handles heavy-duty jobs. Ergonomic handle features easy-to-operate throttle with infinite adjustment of forward and reverse speeds, lift/lower controls, proprietary safety-enhancing emergency reverse function, and horn. Includes an electromagnetic disc brake with automatic dead-man feature that activates when the user releases, the handle. Powered lift has two 12V, 95Ah lead acid deep cycle batteries, an integral battery charger, and battery level gauge. Stacker rolls smoothly on poly-on-steel steer & load wheels. 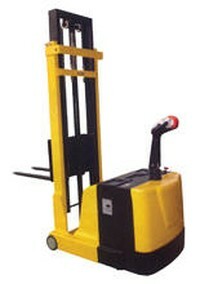 Features 0.7 KW drive and 2.0 KW lift motor. 3-4 hour operation at full charge - 8 hours when used intermittently. Adjustable forks suitable for different pallets. Individual forks are 3 1/8" wide. Overall size is 32 1/2"W x 78"L. A high level of serviceability simplifies maintenance and prolongs equipment life. Easy access battery compartment simplifies battery maintenance. Proprietary safety-enhancing emergency reverse function - When actuated, the emergency reverse belly switch instantly reverses direction and moves the unit forward (away from the operator) until the switch is released or after five seconds have elapsed. The built-in safety circuit will automatically disable the entire unit if the emergency reverse belly switch is activated for more than 5 seconds after which the unit must be re-set to return to normal operating conditions. This state-of-the-art safety device provides a level of operator protection which is unmatched by any unit on the market today. Note: Both batteries are completely maintenance free. Sealed construction eliminates periodic watering and corrosive acid fume spills.